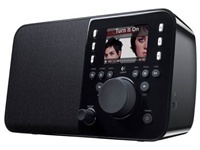 The Squeezebox Radio can playback MP3, FLAC, WAV, AIFF, WMA, Ogg Vorbis, AAC, Apple Lossless audio. Built into the Squeezebox Radio is an 802.11G antenna which supports WPA Personal, WPA2-AES, and 64/128-bit WEP encryption. However, your wi-fi connection must have the SSID broadcast enabled. Alternatively, you can connect through the Ethernet connection, which is a 10/100 Mbps version. Posted by bioss at 5:18 pm on August 26th, 2010.